Customized optimization solutions tailored to your needs. 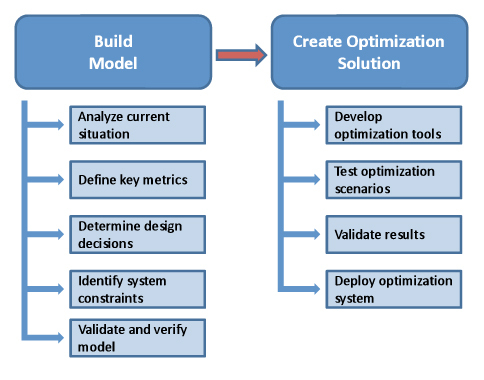 We specialize in developing optimization technology that will enable our clients to solve problems that involve optimizing complex systems, where traditional optimization techniques cannot be used effectively. Our approach, depicted in the figure below, usually consists of two phases: (1) a model-building phase, where we build a “model” (i.e. a mathematical formulation or a computer simulation) of the current situation in order to understand it; and (2) a solution phase, where we implement a system to optimize the parameters of the model, resulting in fast, cost effective, practical solutions without disrupting your day-to-day operations. During the engagement, we train you to use both the model and the optimization system so that they become part of your decision everyday management tools.